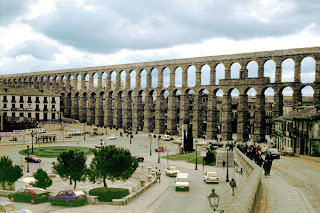 Traveling to the country matador, Spain, you have found time to visit one of the grandest Roman relics of Roman Aqueduct. This historic site is located in the city of Segovia within an hour's drive north of Madrid. 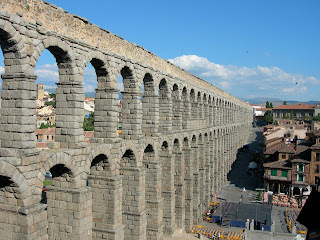 Roman Aqueduct or the ancient Roman aqueduct in Segovia is much visited and photographed by tourists. With a large scale, this makes it an icon of the spectacular. Was built in the 1st century AD under the Emperor Domitian, and may be completed under Trajan in the early second century, this channel serves to bring water from the River Segovia Fuente Fria to within about 16 kilometers. This water channel extending from the southeast end of town in Plaza del Azoguejo to east wall of the old city. The scale and size of the stone is the best of the Plaza. When he was here, be sure to climb the stairs to the city walls to see the sights of the city from a height. At the highest point, the water channel has a height of 93.5 feet from the ground. Magnitude of the visible part of the structure consists of blocks of granite 800 feet, 166 arches and 120 pillars. Amazing facts, not an iota of cement used to build all together. In contrast, the stones were precisely cut to shoulder the burden in perfect balance. Over time, some of the arch in the middle of this aqueduct was destroyed in the 9th century, but later rebuilt in the 15th century on the orders of the Catholic kings. Unfortunately, after a very full life for almost 2,000 years, is now in a state waterways are seriously threatened by pollution and traffic vibration of the modern world. Well, before disappearing in a matter of years can not be suspected, you may be able to put this place in the list a vacation in Spain. visit this site are free.